Sheer spells of magic has been casted onto this timepiece. She can be dress herself into three different looks perfectly. With a gentle touch, the oval swivel of the Magic Hour will dress herself up from a homely horizontal look into a forty-five degree outgoing naughty look. With another gentle touch, she will further dress herself up from the naughty look into a vertical full radiant party look. The clever game of the transformations imbues Magic Hour with charms, surprises, and create a mystery of the world. 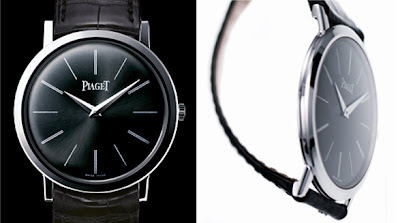 Simple, classic, but elegant, Altiplano displays the wonderful craftsmanship of Piaget. A 2.1 mm thick, hand-wound 430P calibre is housed in an ultra-thin 18K white gold 38mm round model case, and it could be powered up to over 40 hours of reserve. Altiplano illustrates the exquisite blend of tradition, daring, and eternity. 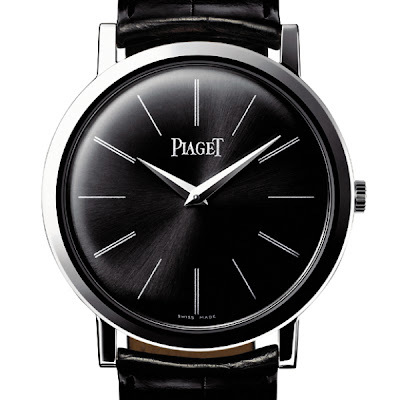 A watch is said to be "simple" when it indicates hours, minutes and seconds. Following this definition, a watch equipped with an automatic mechanical movement, indicating only these functions, would also be considered as a "simple" watch. The same definition applies for a very precise chronometer which indicates the time with a very high degree of accuracy, even though this particular timepiece has been subjected to a series of very stringent tests by the Chronometric Observatory or another official chronometric testing facility. While sometimes people confuse a chronometer and a chronograph, these two timekeepers are not at all the same. Here are the definitions. Chronometer - A watch which has its own "movement" undergone a series of precision tests in an official institute. The requirements are very severe, e.g. a few seconds per day in the most unfavourable temperature conditions and positions that are ordinarily encountered. If the watch "movement" has passed these tests, it will be awarded with an official certificate verifying its ability to maintain accurate time in various positions. The definition of a chronometer was formulated by Contrôle Officiel Suisse des Chronomètres in 1951. Chronograph - A watch or any apparatus with two independent time systems: one indicates the time of day, and the other measures brief intervals of time. Counters registering seconds, minutes and hours can be started and stopped as desired. It is therefore possible to measure the exact duration of a phenomenon. The term chronograph is often confused with the similar but very different term, 'chronometer'. Chronographs generally have a start/stop pusher and reset pusher. One touch of the start/stop pusher activates the (usually) separate chronograph hand. A second touch of the start/stop pusher stops the chronograph. Many chronographs usually measure durations as long as 12 hours, 29 minutes and 59 seconds. A watch is said to be "complicated" when it indicates functions in addition to the time. These may include optical readings using hands or windows, or they may be acoustical in nature, using chimes or bells. In 1993, IWC celebrated its 125th anniversary of innovative watch making in Schaffhausen Switzerland with the release of one of the world's most complicated wristwatch: the "IL Destriero Scafusia". "Il Destriero Scafusia" ref. 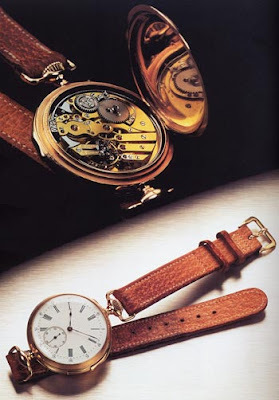 1868 from 1993 is a wrist watch with 21 complications using 750 individual parts. Its perpetual calendar will display the day, date, month, year, leap year and century correctly until year 2499. The moon phase display is the most exact ever made, needing a one-day adjustment in 2115. 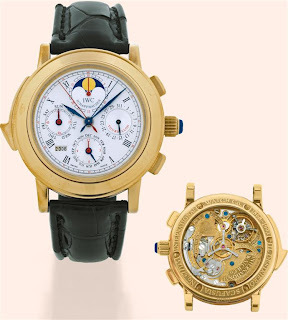 A "grand complication" is a watch that contains at least three "complications", coming from each of the groups listed below. Minute repeater is a complication found in a mechanical watch, in which the time is chimed to the nearest minute. Minute Repeaters were once very popular amongst blind and visually impaired, but nowadays this complication is sought after mainly by watch enthusiasts. In cooperation with Audemars Piguet, Omega created the world first minute repeater in 1892. Lever-escapement Lépine calibre, cut bimetallic balance, winding crown at noon, push-piece time-setting, enamel dial, Roman numerals, sunk small seconds dial, blued steel pear-shaped hands, 18k pink gold case with slide-piece on case-band for winding and triggering the hour, quarter-hour and minute repeater. An example of the ringing procedure is given for the time 3:17 - would be conveyed by the following sequence of audible tones: "dong, dong, dong, ding-dong, ding, ding". Here "dong" corresponds to 1 hour, "ding-dong" corresponds to 15 minutes, and "ding" corresponds to 1 minute. Often, repeating watches are activated by moving a slide located on the side of the case. Doing this winds a subsidiary spring, and allows various levers in the repeating mechanism to fall onto cams that turn with the watch hands. When the button is released, the spring moves the levers back to where they started from. As the levers move, they engage with hammers that hit gongs, thus striking the time. La Rose and La Tulipe are two Extraordinary Watches created by Jaeger-LeCoultre. The timepieces reflect the supreme ability of Jaeger-LeCoultre gem-setters to push the limits of what is considered humanly possible. 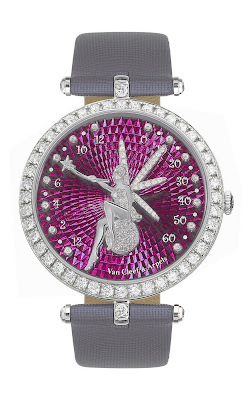 The real 'dream-makers' have devoted more than 600 hours to setting each timepiece, painting a landscape composed of over 3,000 precious stones sparkling like the dew drops. 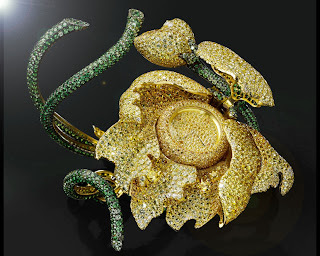 The gem-setters accentuated every curve of the Jaeger-LeCoultre watches, having reproduced every petal one by one. Besides the hand-crafted gem-setting, Jaeger-LeCoultre has invented unique snow-setting and Rock setting techniques. 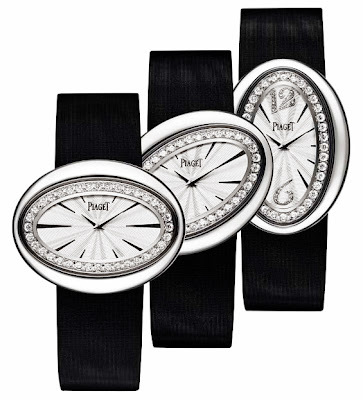 The snow-setting allows the tiniest diamonds nestle against each other to merge with great refinement into watch cases. The Rock-setting finely highlight the radiance of the gems while completely covering the material below. The new techniques have opened a whole new chapter in the Jaeger-LeCoultre history, having given its gem-setters a remarkable chance to achieve an unforeseen level of purity. The remarkable creations of La Rose and La Tulipe are specially designed to adorn the wrists of stars sparkling at the Venice International Film Festival. The art of creating highly complicated watches has always been mastered by only a few. With a strong focus on high utility value complications, Glashütte Original starts making complicated timepieces in 1845. Glashütte, a word originally means "the mine where the shiny metal came from", fell into a great poverty after its silver reserves died out from almost four centuries of mining. Ferdinand Adolph Lange (1815-1875), a master watchmaker to the Saxon court, had brought a new hope to the town by founding the first watch manufactory. 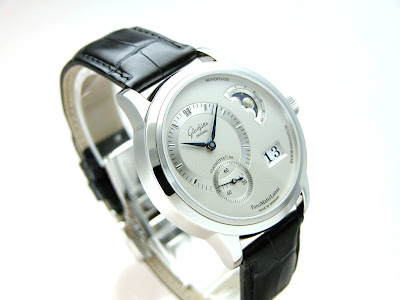 (Glashutte Original PanoDate PanoMaticLunar XL, a white gold watch features a dynamic off center hour and minute with applied rose gold arabics, a sub second, lunar phase, and the characteristic panodate display on a silver galvanized dial in a 42mm case. This Glashütte Original PanoDate PanoMaticLunar XL watch also features an automatic Caliber 90 movement on an antique brown crocodile strap secured with a rose gold tang buckle. The watch is water reisistant to 30M. In the meantime, master watchmakers of the region, Ferdiand A. Lange, Julius Assmann, Ludwig Strasser, Johannes Durrstein, Adolf Schneider, Strasser & Rohde, and Ernst Kassiske were awarded for various gold models at the world exhibitions and international competitions, and thus the foundation and the reputation of the Glashütte watchmaking industry had been created. In the beginning of World War II, the watch manufactories in Glashütte was still in the production of military watches for the Navy and Air Force. Later, in the last day of War World II, Glashütte was bombed from the sky and the factories were badly destroyed. The reminding unaffected factories merged and found the VEB Glashütte Uhrenbetriebe under the rule of East German State. After the reunification of Germany in 1990, The VEB Glashütte was transformed into the Glashütte Uhrenbetrieb GmbH. The skillful master watchmakers remained, and the company, then, was transformed to a global enterprise from the state-owned company. Today, the new name of the company is Glashütte Original, but it is still carrying the old tradition of Glashütte watchmaking for more than 150 years. 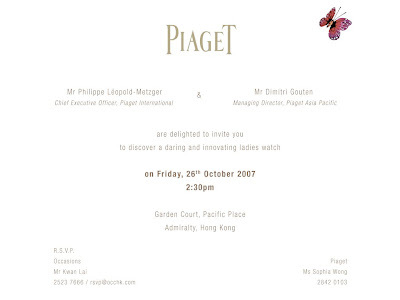 The members are all acknowledged professionals and personalities in the field of Fine Watchmaking. 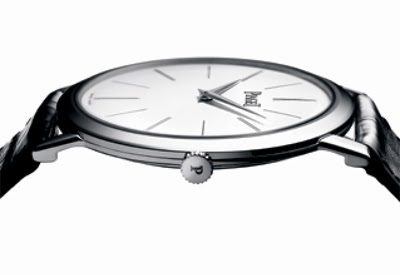 HH is intended to play an all-important role of the reinforcement and the growth of the exceptional horology heritage. Operationally, HH comprises two complementary poles of activity. 1/ The Centre Culturel de la Haute Horlogerie (CCHH) is responsible for the cultural and the institutional activities. 2/ Salon International de la Haute Horlogerie (SIHH) is responsible for the exhibitions and events dedicated to the promotion of Haute Horlogerie. Geneva, Switzerland - The Fondation de la Haute Horlogerie (HH) has announced that the SIHH, the organization's annual invitation-only luxury-watch trade show, will not expand in 2008 due to space constraints. The SIHH (or Salon International de la Haute Horlogerie), scheduled concurrently with the 2008 BaselWorld show from April 7-12, 2008, is being held at the Palexpo in Geneva. Various watch companies have asked to be added to the show's current lineup of 16 brands, but could not be accommodated due to the space required by other exhibitions at Palexpo during this time. "The number of brands exhibiting at the SIHH will remain the same in 2008, with their allocated areas," the HH said in a statement. In related news, the 2009 SIHH, scheduled from Jan 19 - 24, 2009, will not coincide with the 2009 BaselWorld show, scheduled from March 26 - April 2, 2009. "In view of dates that are already confirmed for the Geneva Motor Show and other events programmed by Palexpo, the Basel and Geneva fairs cannot coincide," the HH said. Though Hermès is most renowned for its saddlery, their handbag and luggage collections are widely known as coveted pieces of handmade leather craftmanship. Hermès does not use assembly lines, rather, only one artist may work on one handbag at a time. Because of the use of rare materials (sometimes including exotic skins such as alligator, crocodile, ostrich and lizard as well as precious metals) and because only the highest quality craftmanship is accepted, one bag can take 18 to 24 hours to create. The Kelly bag was first produced in the 1930's and later nicknamed for Grace Kelly, who made it famous after appearing in the pages of Life in 1956 carrying the bag. 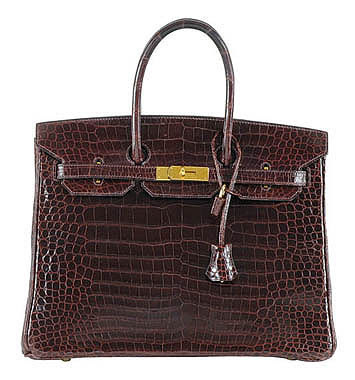 The Birkin, perhaps the most famous handbag, was named for actress Jane Birkin, who co-designed the bag with president Jean-Louis Dumas after complaining that her Kelly was not practical for everyday use. Jane Birkin has since given up carrying her namesake bag, saying it contributed to her tendinitis. Founded in 1837 by Thierry Hermès as a saddlery company, the business has remained mostly in the control of the Hermès family for almost two hundred years. 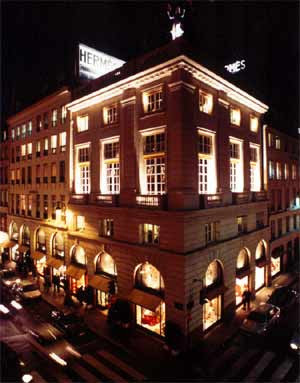 Today, the house of Hermès produces ready-to-wear fashion, home decor, jewelery, luggage, and fragrances as well as saddles. Emile-Maurice Hermès, Thierry's successor, shifted the focus of the company at the turn of the 20th century away from the horse and towards plane, car, and train travel. Hermès manufactured trunks, bags, overnight cases, from its signature saddle leather. Emile also purchased the building at 24 Faubourg Saint-Honoré in Paris, which still houses the flagship store as well as the workshops. 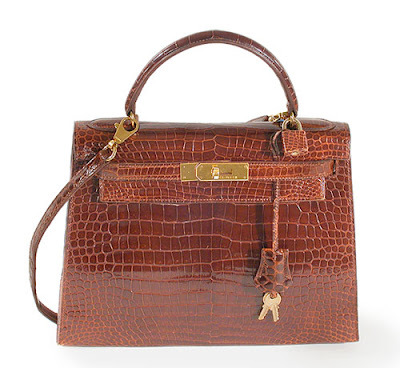 When Hermès leather goods require repair, owners are encouraged to bring the item back to any Hermès store where it can be shipped to the factory in Paris for repair or reconditioning. Bulova is a New York based corporation making watches and clocks. It was founded and incorporated as the J. Bulova Company in 1875 by Joseph Bulova (1851-1936), an immigrant from Bohemia. It was reincorporated under the name Bulova Watch Company in 1923, and became part of the Loews Corporation in 1979. His name is possibly related to Bulawa, a Polish word for a type of mace. Bulova established its operations in Woodside, New York and Flushing, New York, where it made innovations in watchmaking, and developed a number of watchmaking tools. 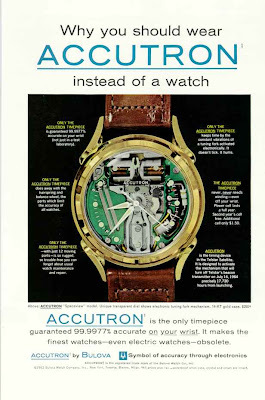 It is famous for a number of horological innovations, perhaps most notably the Accutron watch which used resonating tuning forks as a means of regulating the time keeping function. In July 1941 they paid $9 for the first television commercial, a 10-second spot on WNBT during a baseball game between the Brooklyn Dodgers and Philadelphia Phillies. The Joseph Bulova School of Watchmaking was founded in 1945 by Arde Bulova, Chairman of the Board, initially to provide training for disabled veterans after the Second World War. The tuning fork is between the two electromagnetic coils at the top of the watch, which in turn drive it. 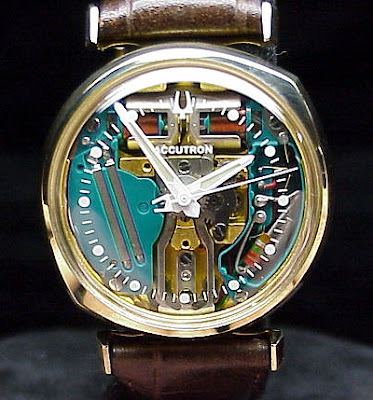 "Accutron" tuning fork watches, first sold in October 1960 by Bulova, use a 360 hertz tuning fork to drive a mechanical gear train. The inventor, Max Hetzel, was born in Basel, Switzerland, and joined the Bulova Watch Company of Bienne, Switzerland, in 1948. This outstanding engineer was the first one to use an electronic device, a transistor, in a wrist watch. Thus, Max Hetzel developed the first watch in the world that truly deserved the qualification "electronic": the world-famous "Bulova Accutron". More than 4 million were sold until production stopped in 1977. They also were subjects of the other famous space era rivalry with Omega Watches for being the first watch on the moon. Ultimately, the Omega Speedmaster Professional chronograph wristwatch (known as the "Moon watch") was designated by NASA for use by the astronauts in all manned space missions, becoming the first watch on the moon on the wrist of Edwin 'Buzz' Aldrin. However, all instrument panel clocks and time-keeping mechanisms in the spacecraft on those missions were Bulova Accutrons with tuning fork movements, because at the time, NASA did not know how well a mechanical movement would work in zero gravity conditions. The Bulova company currently manufactures a limited edition "Astronaut" model under its Accutron line of watches. The back of the watch case is autographed by Buzz Aldrin. Ironically for a company which once touted its tuning fork technology as a major advance over traditional mechanical timepieces, the current Astronaut model features automatic ETA SA movement, making it far more similar to the rival Omega. October 08, 2007 In a move that it hopes will help its expansion in the United States, Japanese watchmaker Citizen Holdings Co. said it would buy rival Bulova Corp. from conglomerate Loews Corp. for approximately $247 million, according to news reports. Citizen said it would buy all shares in Bulova in January from Loews, which has businesses across a number of industries including the financial, tobacco, energy and hotel markets, Reuters reported. A spokesman for Citizen reportedly said the acquisition fits into the company's strategy to diversify its portfolio of brands and strengthen its presence in the $200 to $600 price-point segment of the watch market. A Bulova spokesman added that the move would help expansion in the United States, the world's biggest market for watches. Bulova's brands include Bulova, Accutron, Caravelle and Wittnauer. With a heavenly sent wedding between Estelle Arpels and Alfred Van Cleef in 1896, Van Cleef & Arpels began as most fairy tales' ends. Estelle was the daughter of a precious stone wholesaler and the sister of expert gemologists, while Alfred was the son of a diamond merchant from Amsterdam. In 1906, Alfred Van Cleef and his brother-in-law, Charles, register the name «Van Cleef & Arpels», and the shop settles into 22 Place Vendôme Paris. Van Cleef & Arpels' contemporary watch creations are the finest expression of a successful union of exceptional watch making and high fashion jewellery. Audaciously innovative and stylish, Van Cleef & Arpels watches feature classic forms enhanced with rare and original new features. 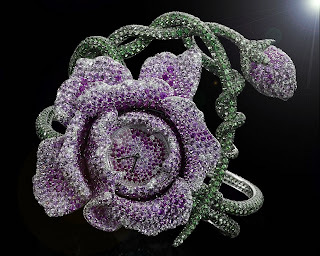 By reinterpreting its own great classics, applying the jeweller’s art to watch cases and dials, and creating complications that surprise and delight, Van Cleef & Arpels confirms its talent as a master jeweller in the world of fine watches.